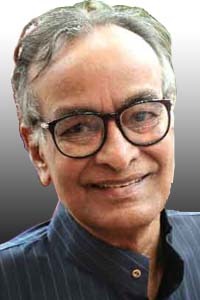 Momtazuddin Ahmed is a Bangladeshi playwright-actor and educationist. He is also active in the field of culture, performance, literature and other socio- political activities. His theatre activities are mostly in the field of satire. Ahmed has written 25 plays for stage, radio and television and directed several of them. Most of his directions and writings were for his theatre troupe Theatre (Natok Shoroni). Apart from plays, he has written several novels, research papers, essays, newspaper columns, screenplays for cinema, text books for primary and secondary educations of Bangladesh. Ahmed taught Bengali, Sanskrit, and European drama in several non-government and government colleges for over 32 years. He was a professor in the department of Bengali, at Jagannath University and a part-time lecturer at the department of Music and Dramatics, at Dhaka University. Rabindra Bharati University has included his writings Bibaha and Ki Chaho Shankhachil in its curriculum. Several of his plays are also included in primary, secondary and higher secondary curriculum in Bangladesh. Bangladesh. Ahmed was a director of the Department of Research and Publications at Bangladesh Shilpakala Academy and as of December 2011 he is serving Bangladesh Permanent Mission to the United Nations as Minister (Cultural). Ahmed received Bangla Academy Award in 1976 and Ekushey Padak in 1997. Bangladesh Shilpakala Academy honored him as one of the outstanding playwrights in Bangladesh in 2008.